VEST To Help The Hearing Impaired To Hear! Currently, the most known gadgets for the hearing impaired are cochlear implants which are very expensive and require invasive surgery. But there is hope for a cheaper option now. 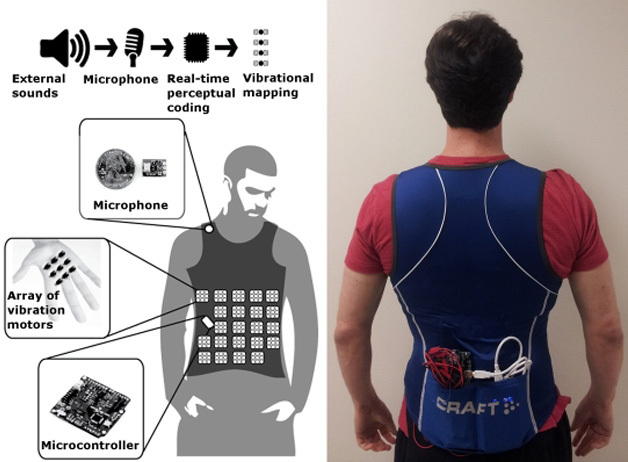 Neuroscientist Dr. David Eagleman and graduate student Scott Novich are developing sensory substation clothing that they say will help the hearing impaired to ‘hear’. The clothing is worn on the torso and it helps in hearing by translating sound into feedback that is perceptible. VEST is an acronym for Vibrotactile Extra-Sensory Transducer. Dr. Eagleman says with proper training the brain can actually learn to translate vibrations into useful data that can make the wearer ‘hear’ through their skin. Dr. Eagleman explains that the brain can’t actually hear. It just interprets electrical signals and presents them to our consciousness as perception. He said even cochlear implants work in a similar manner. Hearing is just the way brain interprets these electrical stimuli which can also be generated through the skin and that is what Eagleman’s research is trying to accomplish. He believes that if the body can interpret signal from ear as sound or data, then it can do the same with sound-based electrical signals from the surface of the skin. Eagleman and his team want to raise $40,000 on Kickstarter so as to refine and build a better prototype.